12 July 2017 - "tries too hard to be contemporary"
As part of the Dickens Uncovered season at the Open Air Theatre, A Tale of Two Cities kicks off the summer season at Regents Park, opening July 2017. Adapted by Matthew Dunster from Charles Dickens’ classic story, this brand new production introduces a season celebrating the life and works of the famous novelist. Originally set against the backdrop of the French revolution, A Tale of Two Cities is catapulted into East London, reimagining the thrill and tension into the infamous 27 Club (including Jimi Hendrix, Kurt Cobain and Amy Winehouse). At a time of political unrest, doomed antihero Sydney Carton’s story remains more relevant than ever. Directed by Timothy Sheader, A Tale of Two Cities is set to have eight actors playing thirty characters. The production opens at Regent’s Park Open Air Theatre on July 7th, playing until August 5th 2017. 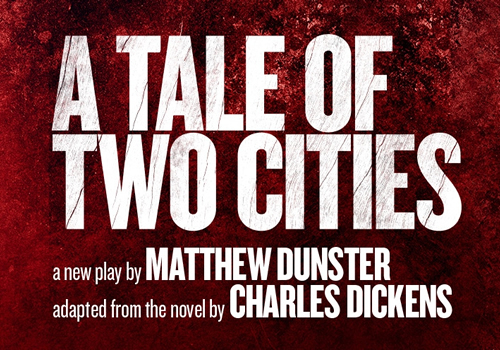 A Tale of Two Cities is suitable for those aged 11 and up.